Getting there: The easiest starting point is just a stone's throw from the Chisos Mountain Lodge parking lot. Near the start you'll find a large wooden sign with arrows pointing in various directions towards the trails that start near that point. Go in the direction of Laguna Meadow or South Rim. The South Rim trail starts off easy, but you can see in the distance where this will take you. The Hike: The South Rim trail straddles the boundary between a backpack trail and a dayhike trail. At 12.6 miles it tends to fill up the better part of the day and leaves one quite drained at the end. There are several excellent camping areas along the trail. But if you insist on tackling it all in one day like we did then you should get as early a start as possible to give yourself lots of time to enjoy the views and get back to the Lodge before sundown. We started off at the waypoint marked "Trailhead". Here you'll find a large wooden sign pointing out the direction to various trails. At the start the trail the gentle hills are in contrast to what lies ahead. Enjoy the easy terrain and get loose for the harder work ahead. The waypoint "4way" marks a major trail juncture. However the metallic signs that you'll see throughout the trail makes it easy to determine the proper direction. For now, follow any sign that points toward Laguna Meadow or the South Rim. 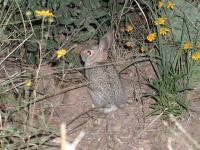 This bunny along the trail did not seem too afraid of humans. Upon approaching the waypoint "Switchbacks" the easy going is over for now. 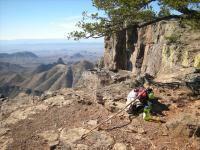 Here you start in earnest the effort to get to the ridge that overlooks the Chisos Basin floor. Switchbacks make going up steep slopes easier, though that by no means implies that getting to the top of this ridge is easy. Expect to huff and puff a bit. Take a few breaks. Drink lots of water and enjoy the view now and then. At this point you can already look back at the Chisos Mountain Lodge and be surprised by how far you've already progressed. After reaching the Ridgetop there's still some climbing to do. But there's also some interesting sights to keep your mind preoccupied. "Ridgetop" is a great place to stop for a breather. The view back into the Basin is beautiful. At this point you're pretty close to the elevation of the South Rim. There's a little bit of climbing left to be done, but the hardest part is over. 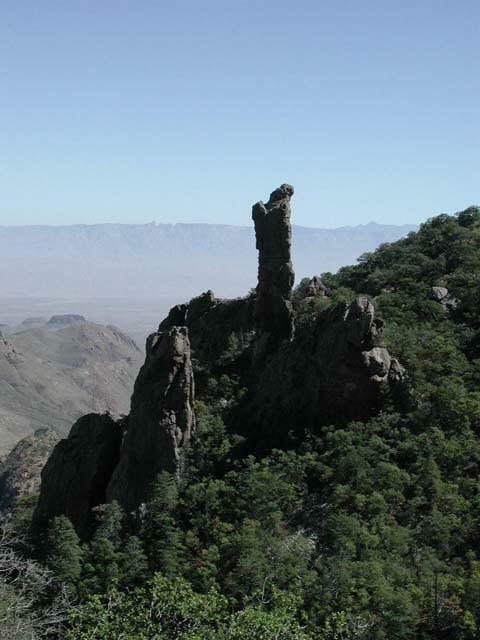 The "Blue Creek Lookout" waypoint indicates the location of a magnificent view down a canyon draining away from the Chisos Mountains. Several years ago a man-made fire swept through the valley. Although the area appears to now be healthy again, it still has not returned to its original state prior to the fire. As always, you should be extremely cautious about fire in the outdoors, particularly in dryer areas. The trail will pass by several camp sites along the way. Depending on the spot they may be near chemical toilets and bear boxes. Bear boxes are located throughout the park and allow for convenient storage of food items and keep the bears out. By avoiding the bears' association of free food with humans the park hopes to keep human-bear confrontations from occurring. So far the tactic appears to be working. The first view of the South Rim that you are likely to see. The waypoint "South Rim" marks the first appearance of the South Rim proper. The views here are excellent and if this marks the only spot at which you can enjoy the view you'll at least understand what all the fuss is about. You can see almost the entire southern half of Big Bend from this spot. To the right, Santa Elena Canyon is clearly visible cutting a slot through the mountains. That's almost 20 miles away and the limiting factor here is the haze in the air, not the terrain. The trail mostly follows the edge of the South Rim towards the northeast. If the entire length of the South Rim trail is too much to tackle you can shave off a few miles from the hike by taking the shortcut back to the start. At the waypoint marked "Turn Right" soon after the South Rim waypoint you can instead take a left and head straight for Boot Spring Canyon. The trail will follow the rim and provide access to spots along the way where its possible to peer over the edge to the cliff. Several of the spots make excellent areas for enjoying lunch while you take in the vistas below. Just be sure to secure everything when you eat so that it does not get blown away by the wind! At some points along the South Rim the dropoff is so steep we got a bit nervous just reaching the camera over the edge for a shot. Perhaps the most striking spot along the south rim is at the waypoint "Big Drop". Here you'll find a ledge that overlooks an almost vertical drop to the desert floor below. The drop is so steep that we were a little leery of getting too close to the edge to admire the view. Those with real vertigo may want to keep an even safer distance from the edge. Soon the trail will turn to the north and then back to the west. You'll have great views of Boot Canyon and Juniper Canyon further into the distance. The terrain here is gentle since it follows the contour of the canyon until it runs into the creek that flows through it. 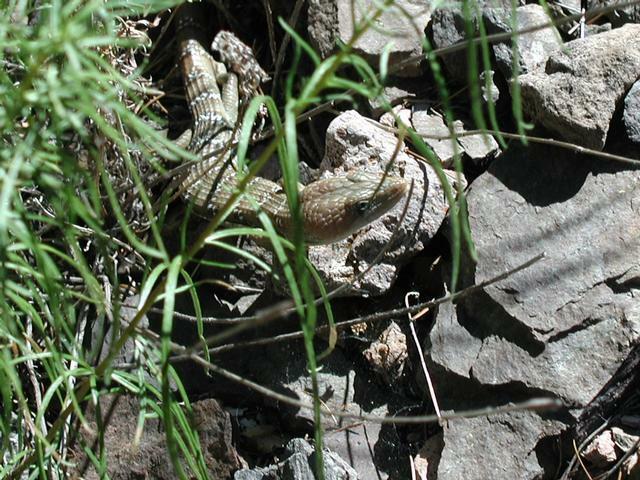 Like the rabbit before it, this Alligator Lizard did not seem too scared of people. When the trail heads north along the creek bed the surroundings change dramatically. The rock rises steeply along the creek's path at times and if you had to fear Mountain Lion attacks this seems like a sure place for you. However, Mountain Lion attacks on humans are extremely rare. You're far more likely to fall and break your leg on the trail. So, there's no need to be too concerned. Just follow the guidelines stated on numerous park brochures and you should be fine. 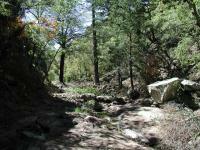 The close confines of the trail along the creek eventually open up as the canyon widens. 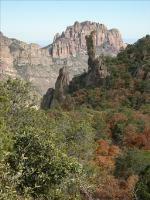 For some distance along the trail you can see a prominent rock spire off the east. One of the better views are afforded at the waypoint "Spire". It should eventually become obvious why this rock formation is called Boot Rock. 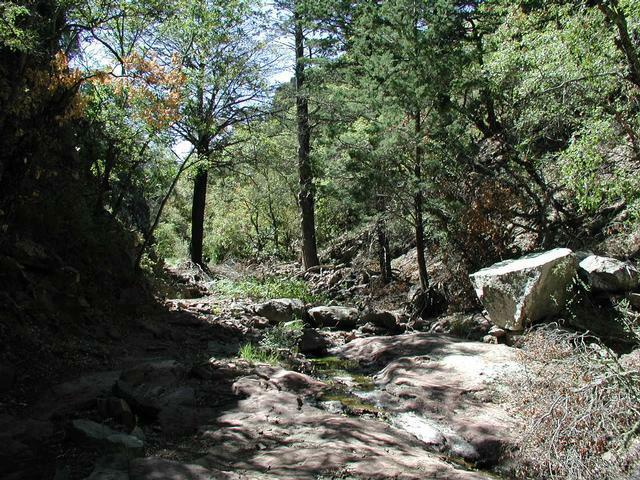 The portion of the trail that travels along the creek bed at times feels claustrophobic compared to the open vistas of the South Rim. 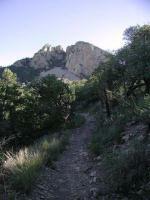 The South Rim Trail runs into the trail that ascends to the top of Emory Peak, the highest point in the park. 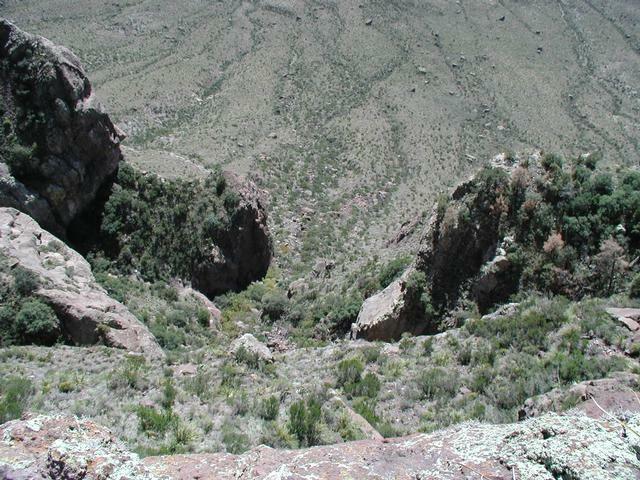 The waypoint "Emory Peak Trail" marks its location. One can hike the South Rim Trail and also tackle Emory Peak in one day, but it's not recommended. The additional 2 miles of the side trail is not that much. It's the additional 1,000 feet of climbing that will really make the day seem longer. This interesting spire is called Boot Rock. Study its shape to understand why. "Switchbacks 2" marks the point at which the trail now works its way back down to the Basin. Like the switchbacks before it, the undulating path is designed to preserve the trail and make the going easier. The switchbacks here seem steeper than the first ones we encountered earlier in the day. Along the switchbacks you should be able to see the Lodge again, a welcome sign. 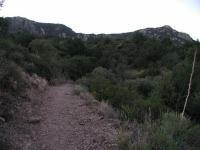 After arriving at the foot of the switchbacks the rest of the trail is relatively easy, and almost all downhill. However, the effort expended throughout the day can make this part seem the hardest of all. Bear and Mountain Lion sightings occurred in this area of the trail within a couple of days of our visit here. 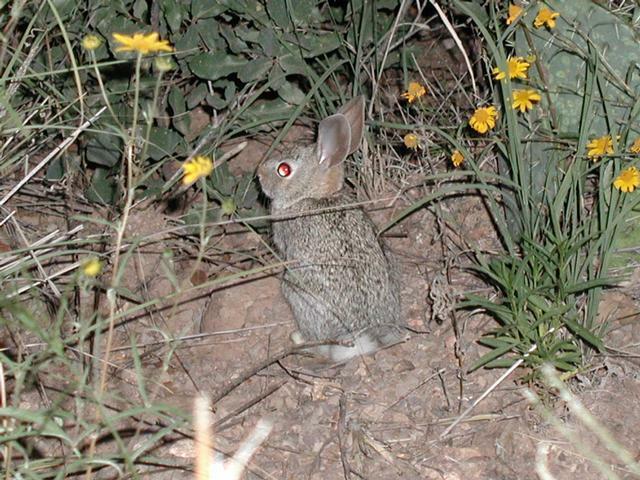 The chances of you seeing one of the elusive creatures is small, but keep you eyes open just in case. 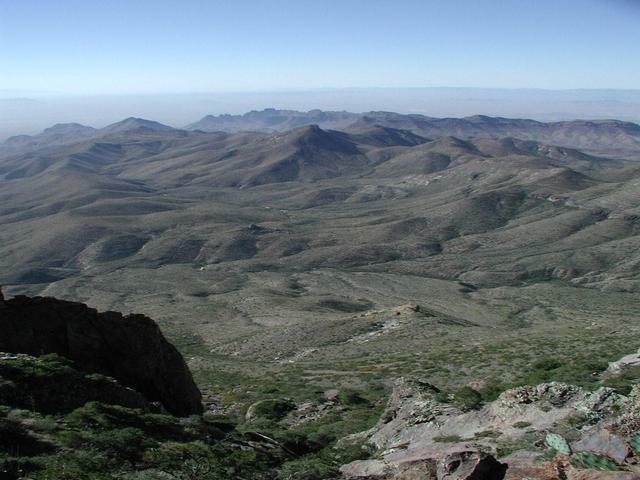 When you finally arrive at the Trailhead starting point you can be satisfied that you've completed the most strenuous day hike in Big Bend and seen some of its most spectacular views. We took things easy the next day to recuperate. A long day walk, but varied scenery and amazing views. 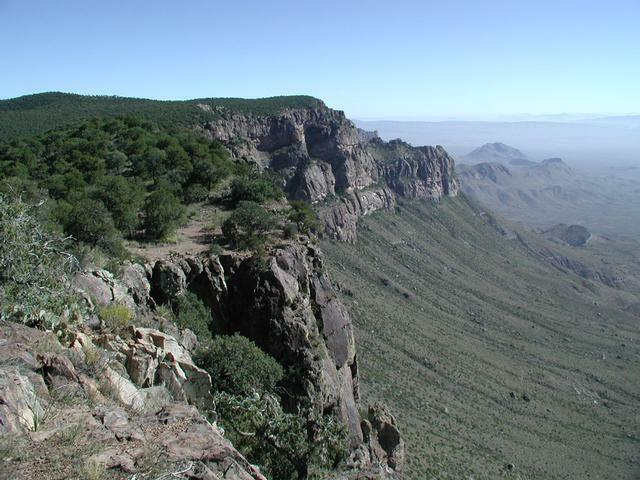 If you don’t like heights or rock scrambling, skip the Emory Peak summit and do the extended South Rim (Northeast and Southeast Rim trails). If you only do one walk in Big Bend – do this one! Beautiful day but we got a late start. We were sucking wind climbing up on this overly hot day (unlike last time). We almost got to the rim and we heard a bear growl. Then it started POURING rain for 2 hours. Looking off the rim we could see sun everywhere but we were combatting lightning strikes with no shelter. We kept hiking down fast in the pouring rain and then it cleared up and was intensely hot again. Bad experience but unforgettable adventure. I enjoyed this hike very much. Some spendid views of the desert south of the mountains. The only issue I had with the hike was the noise from the basin when you were outbound and inbound. Once you cross over the ridge lines its much more peaceful. A Wonderful Hike With Breathtaking Views! 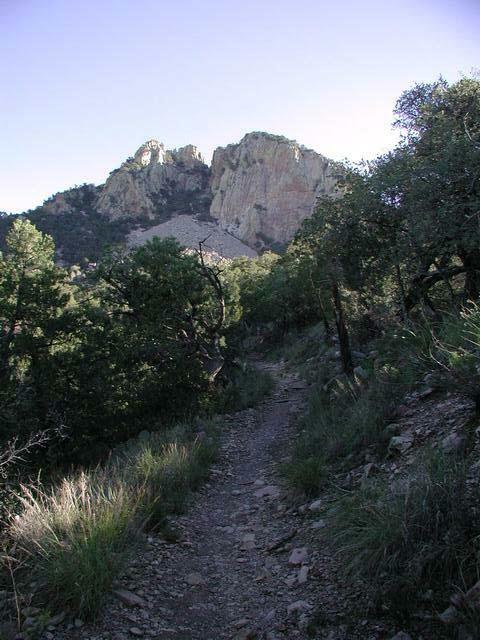 This trail departs near the Chisos Mountains Lodge. I went up the Laguna Meadows Trail, which was pretty much up all the way. There were some nice spots, but the scenery is much better on the other trails. From the Laguna Meadows Trail, I took the Southwest Rim trail which was absolutely fantastic, especially at the South Rim. I then hiked along the Southeast Rim trail, but I could not go all the way around since part of the trail is closed from Feb 1 - Jul 15 due to the Peregrine Falcon breeding season. So I circled back to the Boot Canyon Trail and then along the Northeast Rim. The views here are spectacular also! I then took the Boot Canyon Trail to the Pinnacles Trail back to the Lodge. Along the way, I climbed Emory Peak and then came back down. The way back to the Lodge was almost all downhill, which was helpful because I was pretty exhausted from ascending for many hours earlier in the day. This is not an easy hike, but it is very beautiful. You can do it in one day, but it will take you all day. If you can camp overnight, it'll be much easier and enjoyable. I LEFT OUT ON THE PINNACLE TRAIL @ THE LODGE THAT WAS THE FUNNEST 2 MILES IN I HAVE EVER HIKED. STRAIGHT UP! THE HIKE WAS MAGNIFICENT IT SNOWED ON ME AND THE NIGHTS WERE COLD. BUT THE VIEW FROM THE SOUTH RIM WAS JUST BREATH TAKING. I RECOMEND THIS TO EVERY ONE. I STAYED ON THE RIM THAT NIGHT AND THEN ONE NIGHT IN THE LAGOONA MESA NO BEARS BUT JUST AS BEAUTIFUL AS IT COULD BE. Hiked the Laguna Meadows trail first to the south rim, then set up camp at Toll Mountain. Made it to the top of Emory in time to cook dinner and watch the sun set. Hiked out the Pinnacles trail. 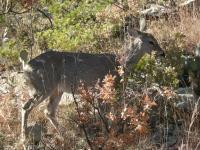 Saw white-tail deer in the morning on the way back to the trail head.